Mediation skills can be used in many ways; at work, in the community, in families and even in your own home. There are opportunities to practice in a voluntary or professional capacity. If you successfully complete our course NFSM would be happy to hear from trainees interested in volunteering and gaining experience in our area. NFSM offers a six day course run over six weeks on two consecutive days a fortnight. The cost is £850 + VAT. NFSM may be contacted to discuss payment options. Course Objectives: For learners to develop a set of skills, attitudes and knowledge to equip them to work as a qualified mediator. Although no previous experience is required, the course is a Level 3 programme that is A Level standard. – undertake participatory exercises in groups with other learners. Unit 1: Interpersonal Communication within the Mediation Process. Unit aim: to communicate effectively at both a practical and emotional level throughout the mediation process. Unit 2: Initial Contact with Mediation Clients. Unit aim: to make and develop contact with clients in order to reach agreement about how the mediation service can be of help. Unit 3: Mediation Sessions Between Parties (Joint Party Mediation). Unit aim: to carry out a mediation session between parties in dispute using a joint party meeting. Teaching methods Audio-visual, practical exercises, discussion, role play, formal instruction. Home-study assignments are given to allow learners to demonstrate and consolidate the learning they have already undertaken in the training room. Assessment method Assessment is the internal process operated by the trainers. Learners are asked to gather evidence to show they have met the standards defined by the Learning Outcomes, and to demonstrate practical skill levels in the training room. Accreditation is an external process undertaken in conjunction with the Open College Network (OCN). It is not graded but on successful completion of the course you will be awarded a pass certificate following the OCN verification. This will usually be within 4 weeks of the end of the course. 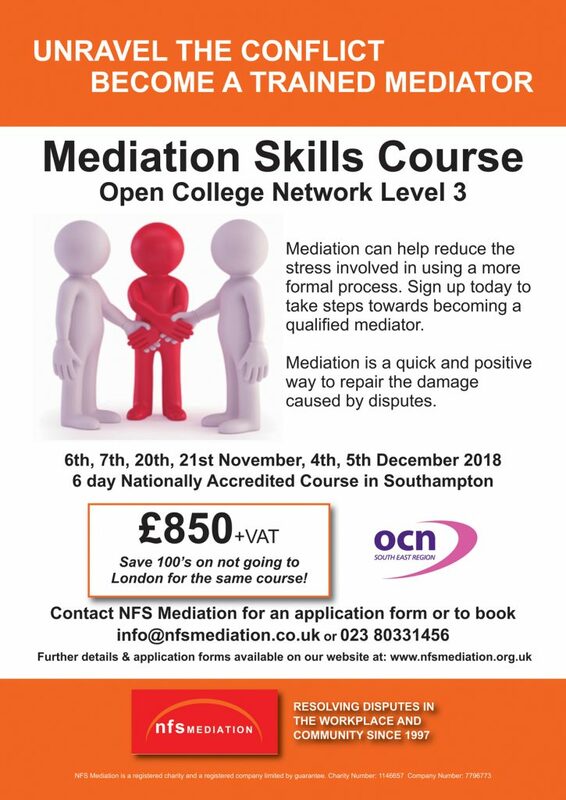 To find out the next available date then contact our training coordinator on 023 8033 1456 or email info@nfsmediation.co.uk. NFS Mediation are independent, impartial, successful and local. NFS Mediation can help. Why not take a couple of minutes to complete our survey on how you manage conflict in your household?